What is antenna calibration and why is it important? An antenna calibration is a verification of performance and the measurement of the antennas properties. Much of the success or failure of EMC test depends on the performance of a calibrated antenna. A mechanical check should be preformed each time an antenna is used. This will ensure that the RF connector is in good condition and that the antenna elements are firmly affixed and are not bent out of shape. At our facility, we calibrate our own antennas, as well as, most other brand antennas in accordance with SAE, ANSI, IEEE and CISPR specifications. See our Antenna Calibration capabilities. 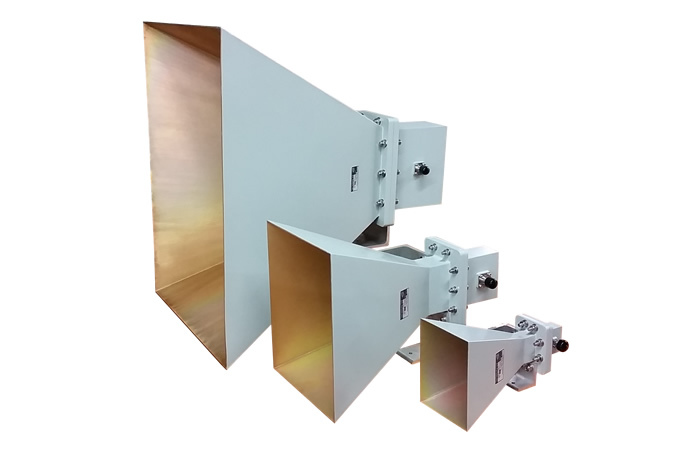 These Octave Horn Antennas offers excellent half power performance With low VSWR, high input handling capability and rugged design; excellent for both immunity and emissions testing.